Urban farming is growing quickly in cities around the world, and will increase as more people will live in cities ( by year 2030, 75% of the world population will live in cities) and climate change affects agricultural production in rural areas. Mega-cities of more than 10 million people will triplicate and in order the feed them, about 6,000 tons of food needs to be daily imported into such mega-cities, traveling an average of 1,000 miles. With the right incentives, urban farmers can produce at least 25% of the vegetables and small animal derived protein needed by urban dwellers. Applying agroecological principles to the design and management of diversified farms can help realize this potential. 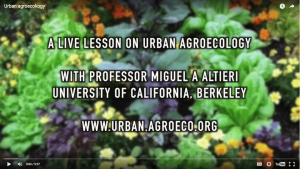 a. short courses to train a critical mass of people on how to use agroecological concepts to design productive urban farms and gardens. c. outreach efforts to raise popular consciousness about the role urban agroecology can play in democratizing the food system. © TEXT Miguel Altieri Lab - All Rights Reserved.